It wasn't so long ago when we first heard about new wearable devices from Lycos, which once had been primarily known for its search engine. This pair of devices—the Lycos Life Band and the Lycos Life Ring—were set to offer some unique new features to separate it from the common pack of wearable tech, and now, one of its most eagerly awaited features is available. 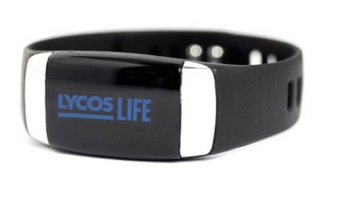 The Lycos Life Band, according to word from the company, is now compatible with iOS devices. When the Lycos Life Band was originally released, it was compatible only with Android devices, with support for iOS devices promised “later this year.” It would have been easy to figure “later this year” as meaning October or November, but “later this year” seems to have meant less than two months later in this case. Indeed, the Lycos Life Band and Lycos Life Ring offered up quite a bit in the way of options, including the ability to learn about a user's everyday life and do things like keep passwords and such on hand so that users could just use sites without having to log in; the devices could take care of that much, and that meant that frequent password changes became a much easier proposition than ever before. Lycos' hardware also offered up plenty of fitness tracking options, motivational tools to help keep good habits going, and even sleep tracking systems, which were uncommon for even fitness trackers to offer. Lycos' advances in the field serve to display just how far the wearable technology market has come over the years, and for an even better look, the Wearable Tech Expo is ready to fill in all the blanks. Running August 18 – 20 at Caesar's Palace in Las Vegas, the show is set to bring together a host of names in the field, including keynote speakers like Gary Davis from Intel Security. Plenty of exhibitions will also be afoot, showing off new advances, and there should prove to be a wide variety of networking opportunities as well. Lycos' new development shows how tech companies can evolve over a lifetime; Lycos went from a major search engine to a wider-range technology firm, and that gives it a whole new shot of value overall. There's something to be said for diversification, and Lycos is showing us just what kind of impact that can have. Lycos' wearable tech offers a surprising depth of power and plenty of useful features, and its expansion to iOS should prove effective at stretching out its market base as well.